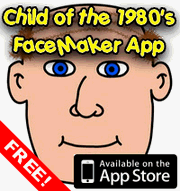 What do you get for the Child of the 1980’s that has everything? A 3D TV? Too expensive! Some new socks? Come on, no one enjoys getting socks for their birthday. How about a newspaper from the day they were born? A great idea, but it’s not like you can just pop down to the newsagents, pop your money on the counter and ask for a copy of The Mirror from 1983 is it? They don’t tend to keep newspapers in stock for more than, let me see, a day? Never fear, for Historic Newspapers are on hand to provide exactly this service. They have a vast archive of just about every big UK newspaper you can think of, dating back in some instances to 1810, so even if you’re buying for a Child of the 1880’s (unlikely I know) then you are probably still in luck. It’s a great idea for a present, not just for birthdays but also for anniversaries of special occasions, or simply something to buy for yourself so you can find out what was happening in the world on the day you were born. I certainly have no idea what the big news was on my birthday, and I think it would be fascinating to find out. And don’t go thinking that all you’re getting is a copy. 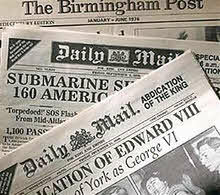 No, Historic Newspapers sell original copies, so you can be sure that you really are buying some pages from history! With a range of presentation options, you really are sure to find something to suit that person who has everything. This entry is filed under Memories	and was posted on April 11th, 2011. You can follow any responses to this entry through the RSS 2.0 feed. You can leave a response, or trackback from your own site. Would like to acquire a copy of any British Newspaper published on the day my brother in law was born im 1948. Please could you send me details of how i can go about this. Thank you. Try clicking on the Historic Newspapers link in the main article, it links to a company that specialise in supplying old UK newspapers.